There are a lot of curious people on the Internet, and Google is there to help answer their questions. The search engine takes note of each inquiry, and generously offers to autocomplete your questions with popular options. 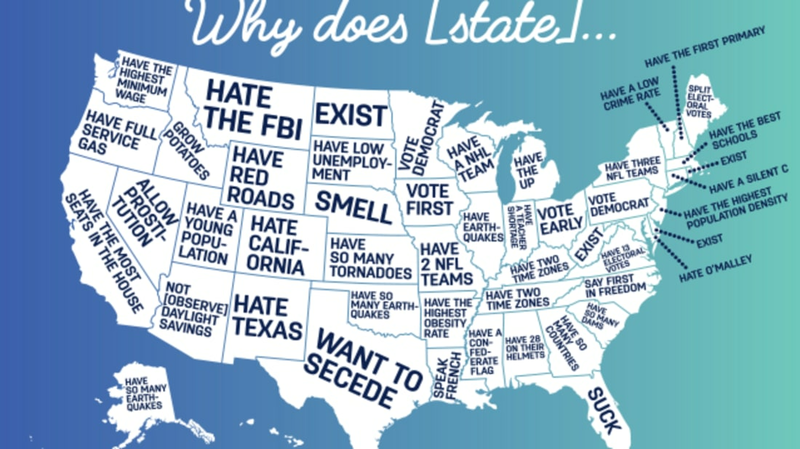 Previously, we investigated the top Google searches for "why is [state] so..." (in Chrome's Incognito mode) and found some pretty enlightening answers. We decided to take another look at what people were scratching their heads over, regarding each state. This time, we asked Google "why does [state]..." and collected a new bounty of colorful questions. To stay on topic, we disregarded questions that referred to the state's sports team instead of the state itself (except for Alabama, because apparently that's all they search for). It's also worth noting for Georgia that the Googlers probably meant "counties" instead of "countries." Maybe?